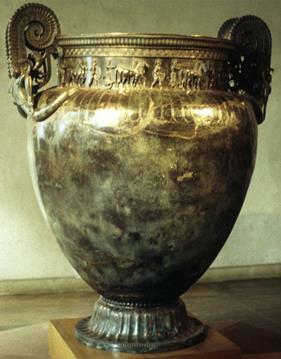 Especially during the Geometric and Archaic phases, the production of large metal 1)… was an important expression of Greek creativity, and an important stage in the development of bronzeworking techniques, such as casting and repousse hammering. Early sanctuaries, especially Olympia, yielded many 2)… of such vessels, deposited as votives. During the orientalising period, such tripods were frequently decorated with figural protomes, in the shape of griffins, sphinxes and other fantastic creatures. Although large metal vessels became less 3)… during the Archaic and Classical periods, their 4)… did not cease entirely. The Vix crater is a famous example dating to circa 530 BC. Ex. 5. Складіть діалог за даною темою. Ex. 1. Вивчити новий лексичний матеріал. Ex. 6. Розкажіть про архітектуру древньої Греції. 1. When did ancient Greece reach its peak? When and by whom was it conquered? Empires, as you have learned, come and go. Rome was no exception. In the fifth century, this great empire suffered the fate that had earlier claimed Egypt, Greece, and the Indus River valley civilization. The period following Rome’s collapse was one of chaos. Today we know this time in history as the Middle Ages. It lasted some one thousand years.